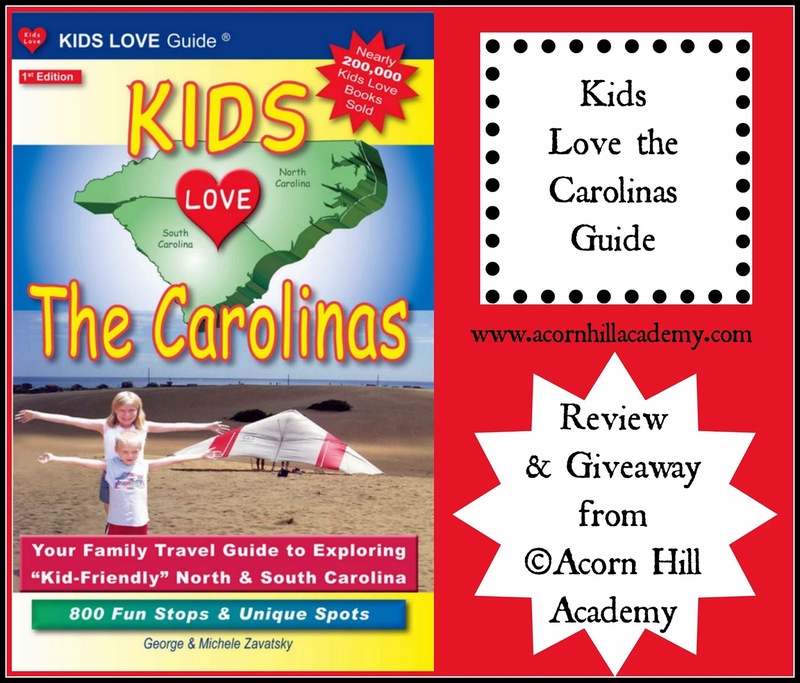 Acorn Hill Academy: REVIEW: Kids Love the Carolinas Travel Guide & GIVEAWAY! REVIEW: Kids Love the Carolinas Travel Guide & GIVEAWAY! When I attended the NCHE conference in May, I had the pleasure of meeting Michele Zavatsky from Kids Love Travel. She and her husband, George, have written guides for 15 states and 2 highways (I-75 and I-95). She gave me a copy of Kids Love the Carolinas to review, and I am so glad she did! I have lived in North Carolina for 16 years, but I know very little about this state. I grew up in Michigan, and in my head, Michigan is still "home." However, in recent years, I've begun to suspect that we will not be moving back up north "any day," and perhaps it's time to get to know North Carolina. I am a homebody by nature, but I have been trying to plan some family activities at least once per month, so the Kids Love the Carolinas book has been really handy in researching possible things for us to do. The Zavrotskys have broken both North and South Carolina into areas, with a map showing the areas clearly designated. There's a city index, and general state agency and recreation information. When you flip to the section you'd like to visit, there is a list of activities by city, and a list of their very favorite things to do in the area. The rest of the chapter contains descriptions of each activity, including ticket prices if applicable and contact information. There is also a handy index in the back, so if you've heard of something you'd like to do but you're not quite sure where it is, you can locate it that way. I'm so impressed with this book! We have had an insanely busy summer, so we haven't been able to do much exploring, but I've learned about lots of things we're definitely going to do when things settle down a bit. Our county is on the border of 2 other areas, so there are many things available to us locally, and truly, I had no idea. My husband did recently take my son to the North Carolina Transportation Museum for a special exhibit, and from the book, we learned they have some special events every year: the Easter Bunny Express, Rail Days, and a Day Out with Thomas. Those are things my son would love, and we wouldn't have known about them without this handy guide. I'm particularly interested to see the Bog Garden in Greensboro. They're supposed to have unique plants you won't see anywhere but in a bog, with a raised walkway to allow you to go through without losing your shoes in the mud. I encourage you to check out the Kids Love Travel website, where they have a great page with tips for using their guides to plan field trips, a family travel blog, and more. The best news? I get to give away a copy of one Kids Love Travel guide to one of my readers! Just enter the Rafflecopter below. One lucky winner will win the guide of their choice! Kids Love Travel Guide Giveaway! Disclaimer: I received a free copy of Kids Love the Carolinas in exchange for my honest review. Great SALE from Homeschool Adventure Co.! Checking in from Boiling Springs!